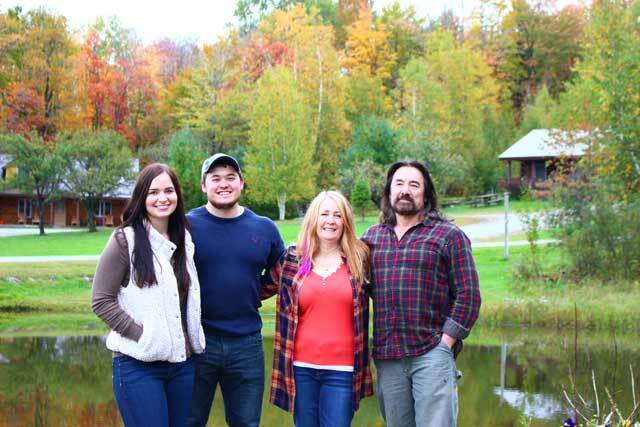 In the summer of 2018 Barb and George Salg became the new owners of Sterling Ridge Resort and started an exciting new family adventure in Vermont hospitality. Having lived in Cambridge, Vermont thirty years ago while they built their home in Bakersfield, Vermont, and then purchasing one of their sugar woods from Sterling Ridge Resort over three years ago, Barb and George are no strangers to the Jeffersonville area. They are also no strangers to Vermont. They have lived in Bakersfield for almost 30 years, raising their family there (Jamie and George Jr), and have spent many years operating their sugarbushes, Snowshoe Pond Maple Sugarworks and Rock Maple Mountain in Jeffersonville and Bakersfield. They had become friends with Susan and Scott Peterson, who had successfully owned and operated Sterling Ridge for over 25 years, through the purchase of their sugarwoods, so when the time came for the resort to be passed on, the Salg family was the perfect fit! With their strong local ties and deep sense of commitment and loyalty to the area, Barb and George are thrilled to be operating the resort with their son, George, and his girlfriend Kirstin. George Jr. followed in his father’s footsteps and graduated from Clarkson University (as did Kirstin) and his mom and dad are thrilled that he has returned to the community he grew up in to live and work. Kirstin grew up in upstate New York and is excited to be living in Vermont and working full time at the resort. Barb’s roots are in Vermont, with many of her family members growing up on dairy farms in Lyndonville. She graduated from University of Vermont and has lived in Vermont ever since. Barb and George are excited to continue sharing the beauty and tranquility of Sterling Ridge Resort with their valued guests, welcoming returning guests and getting to know new visitors. Barb and George are already making plans to invest in the property and will continue to be involved in the community through support of local charitable functions, activities and local businesses. Eventually, they hope to expand resort accommodations and events, which will provide their valued Sterling Ridge guests with many more cherished memories, continuing Susan and Scott Peterson’s legacy. The future is bright at Sterling Ridge Resort! !